Note: The Todd English Restaurant has been replaced on Queen Victoria by the Verandah Restaurant. 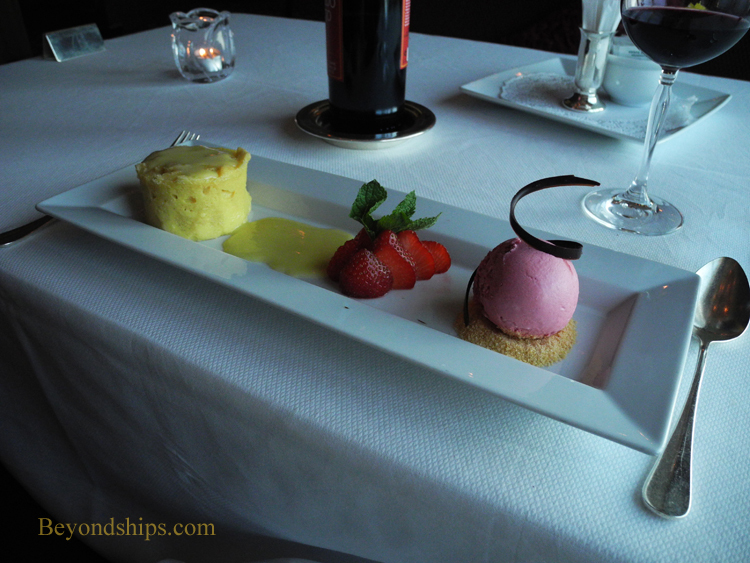 The Todd English Restaurant is the extra-tariff fine dining specialty restaurant on Cunard's Queen Victoria. It bears the name of American celebrity chef and restauranteur Todd English and it follows his recipes and his style of cooking. Chef English is known for his imaginative use of ingredients and his style does not fit easily into any one traditional category. One can see elements of French, Mediterranean, and nouveau international cooking but in the end it is unique. On a ship like Queen Victoria where the main dining rooms, especially the Grills, strive to present traditional gourmet dining experiences, this unique style makes a nice complement. The setting for the Todd English is entirely different than for the original seagoing Todd English Restaurant on Queen Mary 2. Whereas the one on QM2 is located at the back of the superstructure on Deck 8, the one on Queen Victoria is in the center of the ship just off the central atrium. In addition to the difference in location, the decor is different. Whereas on QM2, the décor is a Mediterranean fantasy, the décor on Queen Victoria carries through the ship's overall Victorian theme. It has the look of a 19th Century upscale London restaurant with leather padded dividers separating deep red banquettes along the wall by the windows. Away from the windows are free-standing tables with white fabric on their round backs contrasting with the deep wood color of their frames. Separating sections of the room are gauzy golden curtains that give the whole a dream-like feel. During the evening, the ship's string quartet often plays on one of the terraces overlooking the atrium. Due to its proximity, the quartet's music can be heard as a background in the restaurant. At other times, recorded music is played. In either case, the level of the music is kept soft and non-intrusive. The service on both occasions that I visited the Todd English was flawless, From the greeting by the maitre d' at the door, the selection of the wine with the sommelier, the presentation of the courses by the server to the conversation with the restaurant chef at the end, everyone was friendly and interested in providing an elegant dining experience. The Todd English Restaurant is open for lunch on sea days and for dinner each evening. 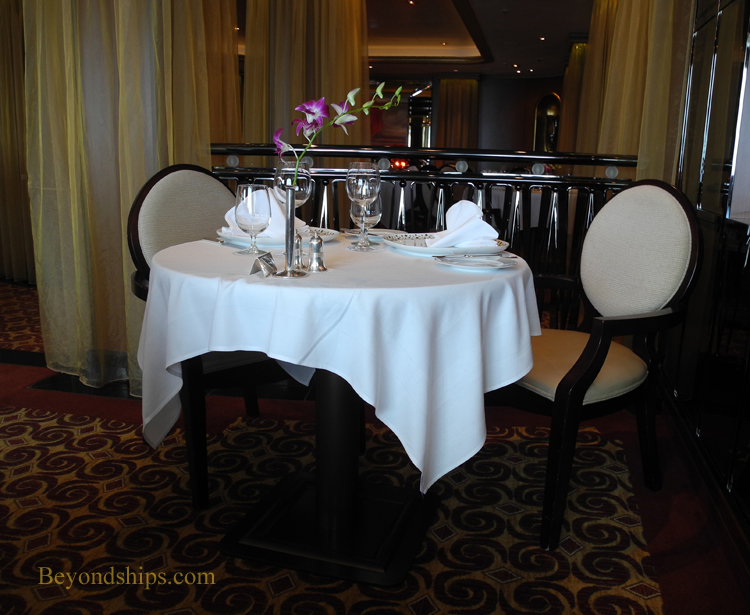 When the restaurant first opened on QM2, there was a set price for lunch and a set price for dinner. The price for the meal was the same regardless of how many menu items you ordered. Now, the restaurant has gone over to ala carte pricing for both meals, i.e., there is a price for each item on the menu and your total charge is the sum of the prices of the items that you order. I was told that this change was due to complaints by guests who only had say an appetizer and a main course about having to pay the same price as someone who had a whole meal. This change is unfortunate. The earlier cover charges were a bargain - - far below the price of such a meal elsewhere. Thus, even if you did not eat all of the courses, you were coming out ahead economically. The prices of the individual items under the present system are also below what you would expect in a comparable restaurant on land. But tying the choice of what items to order to mundane economics undermines the previously care-free atmosphere of this special dining experience. Both lunch and dinner begin with the presentation of a basket of Todd English's homemade breads. These are not the collection of crusted cannonballs and fossilized slices of flavorless French bread that one chews on to pass the time while waiting for the first course in some restaurants. Rather, they are three unique varieties of bread. The cheese and caramelized onion is particularly good. 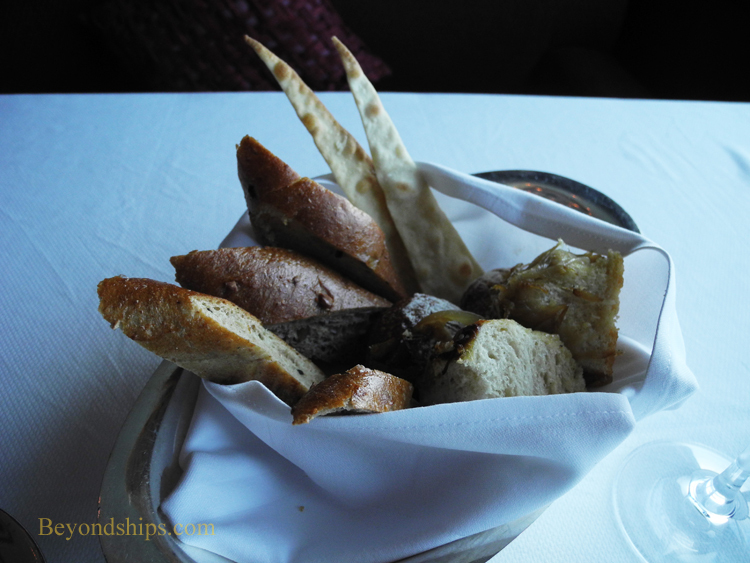 To accompany the bread, the server brings both green olive and black olive spreads. In addition, unlike the Todd English on QM2, butter is also offered perhaps in deference to the difference in the demographics of the ship's clientele. Most of the appetizers are different depending upon whether you are having lunch or dinner. 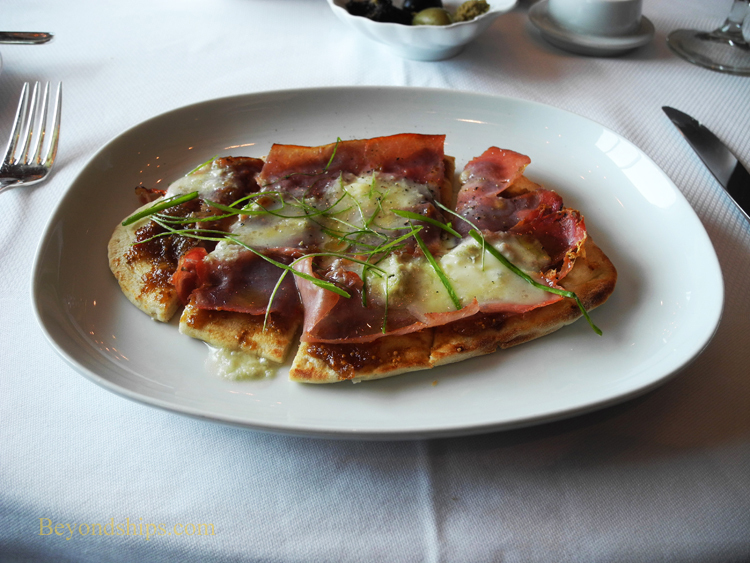 However, one that is common to both is the fig and prosciutto flat-bread. One may well ask why have another round of bread after being served a basket of tasty bread. An answer could be that this dish is not really bread per se but more like a pizza. However, the simple answer is that this dish is addictively good. The sweetness of the fig puree contrasts against the salty flavor of the ham and pungency of the Gorgonzola blue cheese. The flat-bread itself does not intrude upon these flavors but rather provides a supporting bed like the rhythm section during a guitar solo. 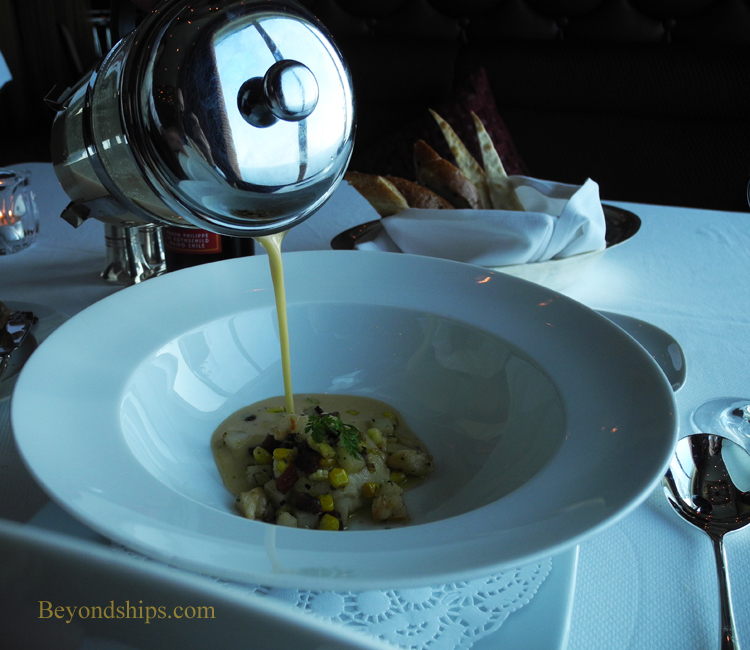 An interesting starter course on the dinner menu is the lobster and baby corn chowder. The bowl arrives at the table with a mixture of fresh corn, parsnips, bacon and bits of lobster at the bottom. Next, the server pours a creamy lobster bisque over the mixture. This ensures the freshness of the soup and prevents the flavors from blending together into an indistinguishable sameness. 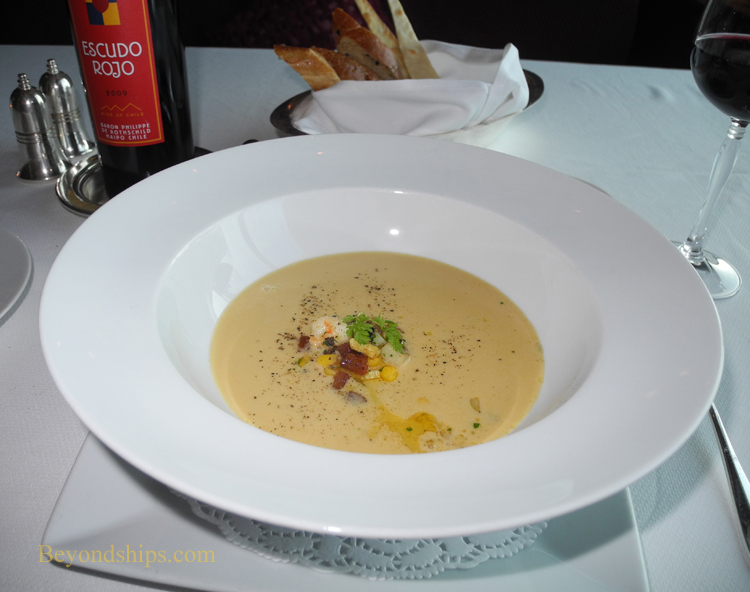 Again, you have nice contrasts such as the bacon against the creamy bisque. 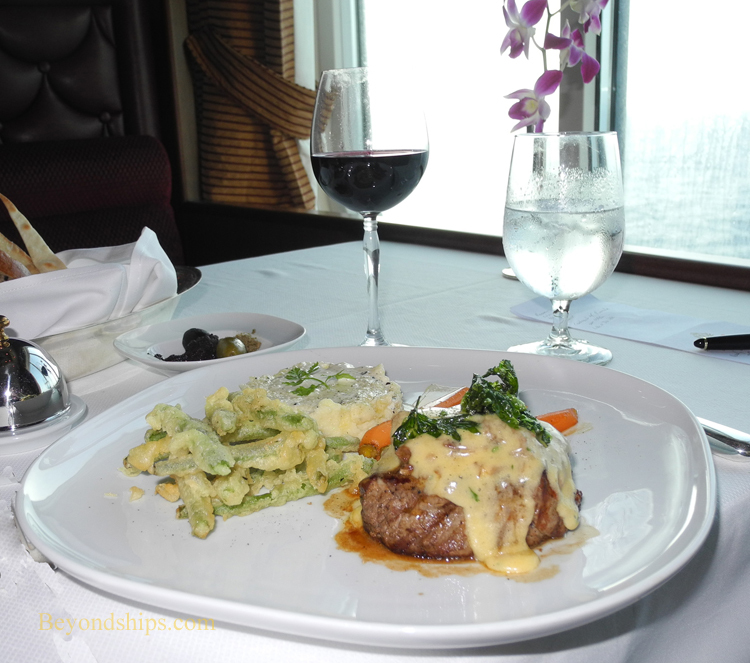 For lunch, I had the “Grilled Sirloin Cobb” for the main course, a dish I have enjoyed several times on QM2. This is Chef English's take on a cobb salad and is unlike the cobb salads you will find elsewhere. It is not a salad as such although it does have ingredients that you will find in a salad. There is a chunk of gem lettuce, there are bits of English bacon, hard boiled egg, and avocado vinaigrette with Danish blue cheese. However, rather than being mixed together each has its own place on the plate along with a fresh zucchini, a potato and a mini-corn-on-the-cob. Off to one side is the main event - - slices of sirloin steak. These were tender, flavorful and contrasted nicely with the sauce of tomatoes and sugar shallots. 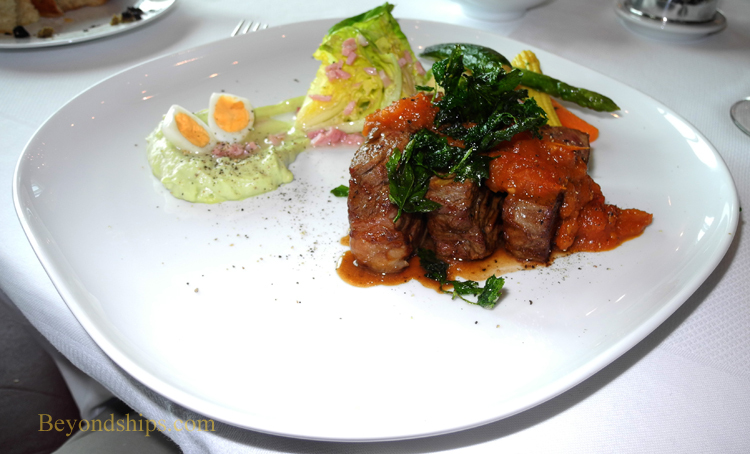 The grilled beef tenderloin at dinner was a more straightforward presentation - - it was exactly as you imagined it would be when you read the description on the menu. Moreover, the constituent items of this dish did not present as much contrast as the main course that I had for lunch. Having said this, the steak itself was again tender, almost like a nicely-cooked roast beef, with a nice Bearnaise sauce. The various vegetables were crisp in the American style. But the surprise hit was the excellent whipped truffle potato made with truffle oil and cream. While the portions do not look large, by the time you finish the main course, you know you have had a big meal. Nonetheless, the desserts do not shy away but are also substantial. Both the lunch and dinner menus feature the same line-up. In each of the desserts, Chef English balances sweetness against tartness. To provide a respite from these conflicts, there is often a simple ice cream. Thus, in the chocolate fallen cake, a souffle-like cake flooded with melted dark chocolate, the flavor contrasts are provided by a tart raspberry sauce and the accompanying vanilla ice cream. This is a chocolate lover's delight. Wild blueberries are balanced against an oatmeal crust and vanilla ice cream in the Wild Maine Blueberry Cobbler. For me, this dessert is the best counterbalance to the previous courses. 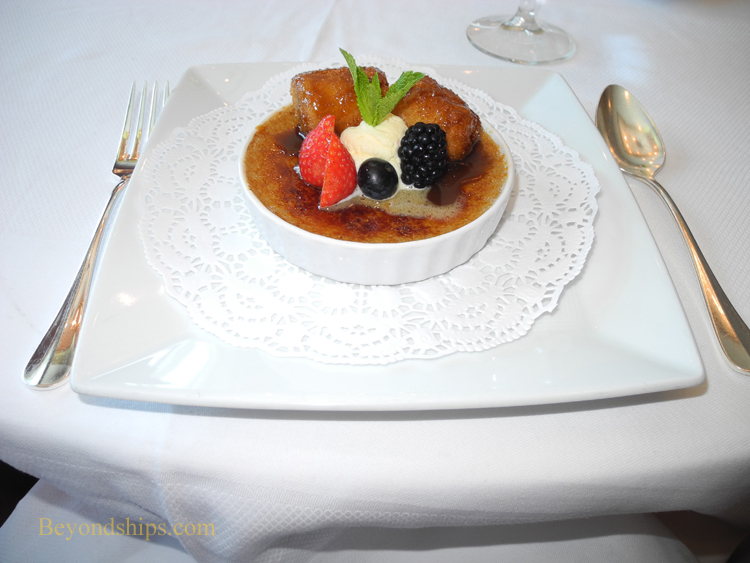 The contrast in the banana crème brulee also comes from the fresh berries as well as from the banana puree. However, the overall experience is much different than the previous dish. A dish that is altogether different is the white chocolate bread pudding. This dessert successfully avoids the sickly sweetness that often plagues white chocolate Rather, it is an egg custard similar to a souffle. The strawberry ice cream is again a nice balance. The experience at Todd English can be hypnotic. On a summer voyage through the Mediterranean, you can look out the windows and see the coast of Sicily or perhaps North Africa. The evening sun has created pastel colors of gold, blue, pink and gray. Inside, there is soft music, pleasant scents, and invigorating tastes as you relax on a comfortable banquette. In short, all the senses are engaged.